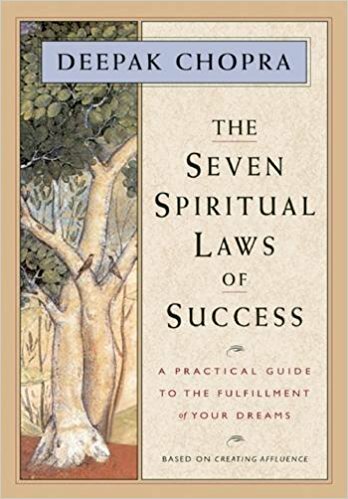 Excerpted from The Seven Spiritual Laws of Success by Deepak Chopra. Copyright © 1994 by Deepak Chopra. Excerpted by permission of Amber-Allen/New World Publishing. All rights reserved. No part of this excerpt may be reproduced or reprinted without permission in writing from the publisher. HTML and web pages copyright © by SpiritSite.com. The experience of the Self, or "self-referral," means that our internal reference point is our own spirit, and not the objects of our experience. The opposite of self-referral is object-referral. In object-referral we are always influenced by objects outside the Self, which include situations, circumstances, people, and things. In object-referral we are constantly seeking the approval of others. Our thinking and our behavior are always in anticipation of a response. It is therefore fear-based. In object-referral, your internal reference point is your ego. The ego, however, is not who you really are. The ego is your self-image; it is your social mask; it is the role you are playing. Your social mask thrives on approval. It wants to control, and it is sustained by power, because it lives in fear. Your true Self, which is your spirit, your soul, is completely free of those things. It is immune to criticism, it is unfearful of any challenge, and it feels beneath no one. And yet, it is also humble and feels superior to no one, because it recognizes that everyone else is the same Self, the same spirit in different disguises. That’s the essential difference between object-referral and self-referral. In self-referral, you experience your true being, which is unfearful of any challenge, has respect for all people, and feels beneath no one. Self-power is therefore true power. Power based on object-referral, however, is false power. Being ego-based power, it lasts only as long as the object of reference is there. If you have a certain title – if you’re the president of the country or the chairman of a corporation – or if you have a lot of money, the power you enjoy goes with the title, with the job, with the money. Ego-based power will only last as long as those things last. As soon as the title, the job, the money go away, so does the power. Self-power, on the other hand, is permanent, because it is based on the knowledge of the Self. And there are certain characteristics of self-power. It draws people to you, and it also draws things that you want to you. It magnetizes people, situations, and circumstances to support your desires. This is also called support from the laws of nature. It is the support of divinity; it is the support that comes from being in the state of grace. Your power is such that you enjoy a bond with people, and people enjoy a bond with you. Your power is that of bonding – a bonding that comes from true love. How can we apply the Law of Pure Potentiality, the field of all possibilities, to our lives? If you want to enjoy the benefits of the field of pure potentiality, if you want to make full use of the creativity which is inherent in pure consciousness, then you have to have access to it. One way to access the field is through the daily practice of silence, meditation, and non-judgement. Spending time in nature will also give you access to the qualities inherent in the field: infinite creativity, freedom, and bliss. Practicing silence means making a commitment to take a certain amount of time to simply Be. Experiencing silence means periodically withdrawing from the activity of speech. It also means periodically withdrawing from such activities as watching television, listening to the radio, or reading a book. If you never give yourself the opportunity to experience silence, this creates turbulence in your internal dialogue. Set aside a little time every once in a while to experience silence. Or simply make a commitment to maintain silence for a certain period each day. You could do it for two hours, or if that seems a lot, do it for a one-hour period. And every once in a while experience silence for an extended period of time, such as a full day, or two days, or even a whole week. What happens when you go into this experience of silence? Initially your internal dialogue becomes even more turbulent. You feel an intense need to say things. I've known people who go absolutely crazy the first day or two when they commit themselves to an extended period of silence. A sense of urgency and anxiety suddenly comes over them. But as they stay with the experience, their internal dialogue begins to quieten. And soon the silence becomes profound. This is because after a while the mind gives up; it realizes there is no point in going around and around if you - the Self, the spirit, the choice-maker - are not going to speak, period. Then, as the internal dialogue quietens, you begin to experience the stillness of the field of pure potentiality. Practicing silence periodically as it is convenient to you is one way to experience the Law of Pure Potentiality. Spending time each day in meditation is another. Ideally, you should meditate at least thirty minutes in the morning, and thirty minutes in the evening. Through meditation you will learn to experience the field of pure silence and pure awareness. In that field of pure silence is the field of infinite correlation, the field of infinite organizing power, the ultimate ground of creation where everything is inseparably connected with everything else. In the fifth spiritual law, the Law of Intention and Desire, you will see how you can introduce a faint impulse of intention in this field, and the creation of your desires will come about spontaneously. But first, you have to experience stillness. Stillness is the first requirement for manifesting your desires, because in stillness lies your connection to the field of pure potentiality that can orchestrate an infinity of details for you. Imagine throwing a little stone into a still pond and watching it ripple. Then, after a while, when the ripples settle down, perhaps you throw another little stone. That's exactly what you do when you go into the field of pure silence and introduce your intention. In this silence, even the faintest intention will ripple across the underlying ground of universal consciousness, which connects everything with everything else. But, if you do not experience stillness in consciousness, if your mind is like a turbulent ocean, you could throw the Empire State Building into it, and you wouldn't notice a thing. In the Bible is the expression, "Be still, and know that I am God." This can only be accomplished through meditation. Another way to access the field of pure potentiality is through the practice of non-judgment. Judgment is the constant evaluation of things as right or wrong, good or bad. When you are constantly evaluating, classifying, labeling, analyzing, you create a lot of turbulence in your internal dialogue. This turbulence constricts the flow of energy between you and the field of pure potentiality. You literally squeeze the "gap" between thoughts. The gap is your connection to the field of pure potentiality. It is that state of pure awareness, that silent space between thoughts, that inner stillness that connects you to true power. And when you squeeze the gap, you squeeze your connection to the field of pure potentiality and infinite creativity. There is a prayer in A Course in Miracles that states, "Today I shall judge nothing that occurs." Non-judgment creates silence in your mind. It is a good idea, therefore, to begin your day with that statement. "Your true Self, which is your spirit, your soul, is completely free of those things. It is immune to criticism, it is unfearful of any challenge."